I see the solar flux ended the day Sunday over 100 for the first time since 2005. Yet Sunday afternoon, 10m was still just as dead as a doorknob. Spent a few minutes several times hunting beacons, but only the local one here in FM05 was audible. 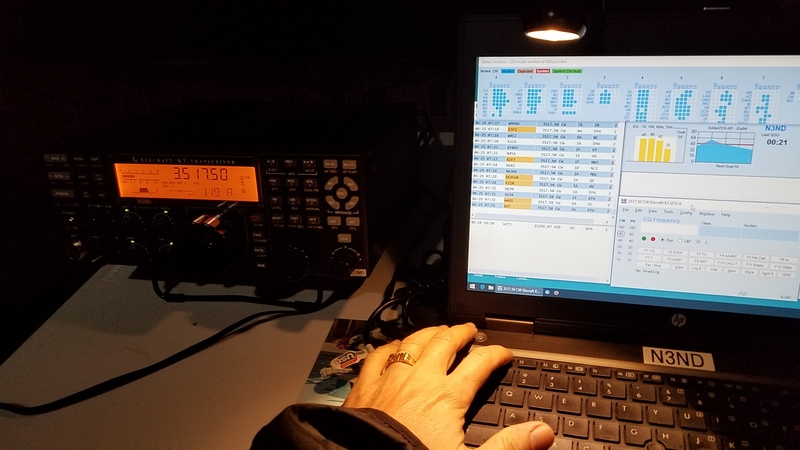 Didn’t hear much on 15m either, but there were a few CW Q’s and some RTTY signals. One very faint SSB QSO. Perhaps a few days of flux will help improve conditions. What with ARRL DX CW coming, that would be a welcome change. There’s a three week window here where the temperatures will be moderate and the leaves are not yet budding. Plan? None yet occurs. The 10/15m loop is probably in a spot that might be better used for the 160m vertical. The 160m vertical is a bit on the long side, and the darn thing is working – kinda-sorta hate to “fix” something that works. But there’s also K2AV’s new idea for the radial/counterpoise to consider. Not sure what the real fun factor is in the situation. In the end, the real plan is to maximize the fun. So, where’s the long-term fun gonna be? 40m and 80m? Never much cared for 20m……although it has its moments. For the current moment, procrastination may cause the ideal antenna work window to come and go. 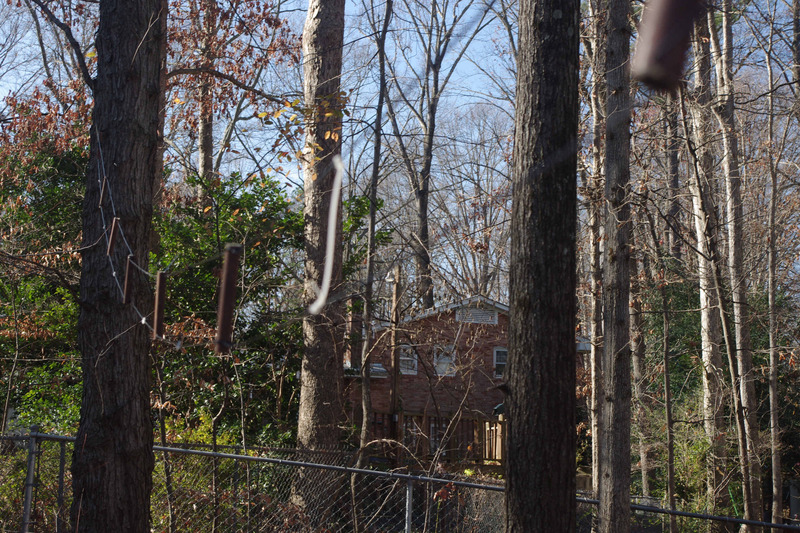 The squirrels in the biological antenna support structures may get to enjoy spring unmolested. The 160 Inverted-L is about 160 feet of wire. To get a good match there is a series capacitor in line with the wire. The bandwidth for any useful value of capacitance is about 40kc. The object is to use a set of relays to switch in or out additional capacitors. That will allow the antenna to be tunable across most of the band – from 1800kc to 1930kc. There is also a 1.5:1 unun at the feed point, followed by a coax cable choke. This lowers the SWR to a very nice 1.1:1 over the useful range. The rig is very happy at resonance, and a good match will be a dial click away. Currently the capacitance in the system gives a nice 1:1 SWR at 1825kc. 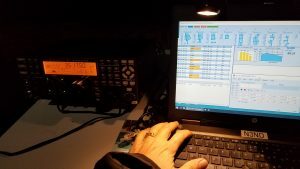 Using the autotuners, either radio [K2, FT-920] can work from 1800 to 1875. The goal is to be able to turn off the tuners and feed the antenna directly. Maybe I’ll pick up a few extra QSO’s with a good match on the antenna end of the feedline. After several other projects using relays and the 3kv Panasonic capacitors for the band pass filters, enough extra parts are in the parts bin to make it happen. So, why wait? A handy nearby line previously shot into a nearby biological antenna support provides an opportunity for expansion. The line seems well placed to add an INV-L element for 80m. 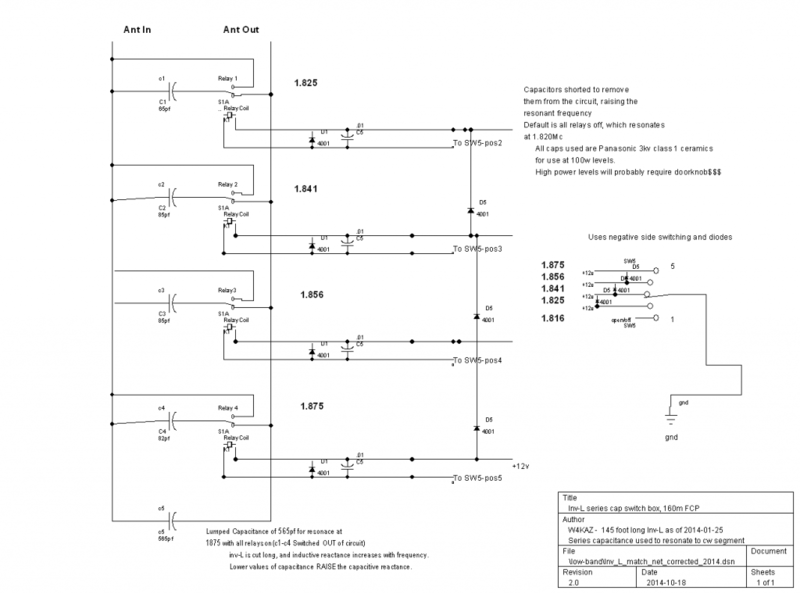 One additional relay for switching bands. Judicious choices for the capacitance values may allow the sharing the capacitor banks for either antenna. Being able to cover the CW segments is most important, so the minimum value used would ideally resonate each wire near the bottom of either band. Hmmmmm. Time to pull the 80m wire up and start tinkering. Finishing up on the yearly mess of litter generated by the biological antenna supports was much more painful this year[literally]. 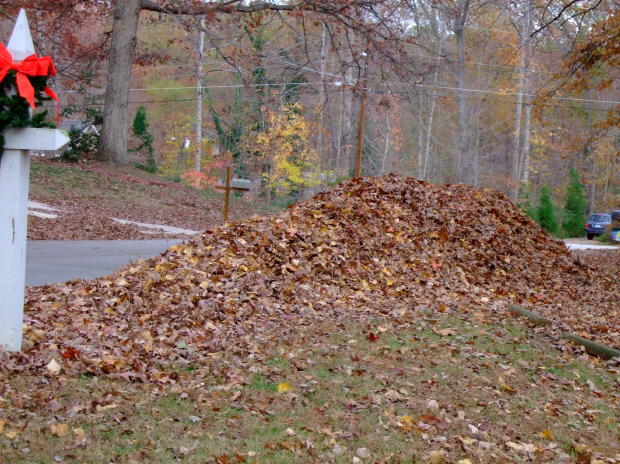 The wet weather makes dragging large quantities of sopping wet leaves a real chore. Messy too. Using a leaf blower here is equivalet to bailing the Titanic with a teaspoon. Futile. The massive quantity ofvegetative miscreants combined with a gentle uphill slope renders the leaf blower useful only for clearing small areas. Maybe a chainsaw…..
During the process, two of the radials on the K9AY were “discovered” to be broken. [Ooops!] 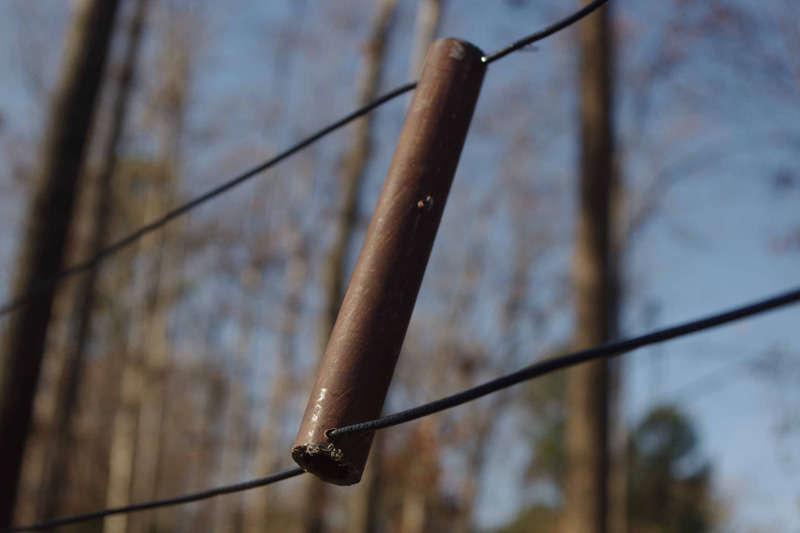 The radials were simple 17 ga. AL electric fence wire, purchased for a pittance in 1/4 mile quantities from the local farm supply. These radials were in direct contact with the soil. Soil testing a few years back showed the PH to be about 5, slightly acidic. No real idea of the chemical/mineral content, which I expectis probably a bigger factor than the acidity. These radials have been in place for about four years. I broke both of them while raking leaves. A closer examination showed that the portions of the wire in direct contact had become quite brittle. It took little pressure to break them this year, although they withstood similar abuse over the past three seasons. A closer look showed the aluminum to be getting flaky in spots, and it had zero ductility. Even an easy bend was enough to break the wire in those areas of heavy oxidation. Not too shocking a discovery, but worth documenting. Aluminum radials are good for about three or four years on the soil surface – in this yard. Conversely, the three year old elevated radials on the inverted-L were inspected just before the 2009 ARRL 160m contest. These seemed to be in fine shape, with no visible signs of oxidation and no new breaks despite catching a few falling branches over the past year. Sothe K9AY radials will be replaced with chunks of the equally cheap WD-1A surplus “field wire”. May as well see how long that lasts too. Pollen must be good for antennas. Two new ones sprouted up over the past weekend on new lines I shot into the biological supports before the kids’ spring break from skool. I somewhat reluctantly packed up the 15m/10m nested rectangular loops. The support was just too good a height(about 15m/50 ft.) and location to leave it being used on relatively unproductive bands. In its place there is now a 40m dipole that favors the NW/SE directions. A bit of tuning around the 40m band doing A/B comparisons between the new dipole and the old NE/SW dipole showed promising results. The new dipole is much better into 8-land and 9-land. The old is better into 2-land and Europe. For some reason most of FL seems about the same on both. Interesting. The differences on rx signal strength is more than I expected in a lot of cases. It makes little difference for strong signals, but a lot of difference on weaker signals. Hopefully this will help add Q’s to the contest logs. It also is a bit of commentary on the non-linearity of S-meters. The antennas are at an almost perfect 90 degree angle to one another. They do not actually cross one another. Looking down from above they form an L shape with the south end of the NE/SW antenna pointing towards the eastern most tip of the NW/SE antenna. Modeling showed ther was little interaction between two dipoles in that configuration, but it seems likely they are not completely invisible to one another. I’m happy with it so far. 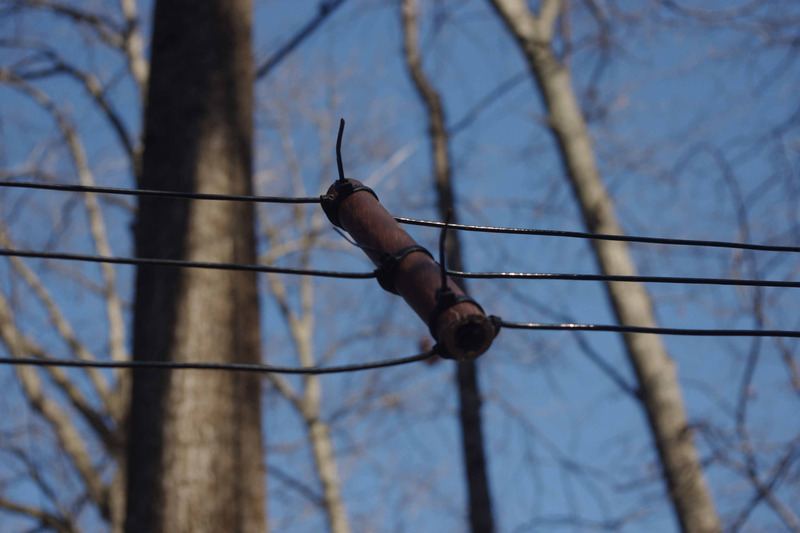 The lesson learned here is that a single fixed dipole is leaving gaps in the coverage. The solution is simple. If it is practical to do so, adding a second dipole at 90 degrees to the original will definitely help fill in the holes. It’s not as good as a yagi, but better than a single fixed dipole. A rotatable dipole would also do the job if you remember to turn it. Note: switching between dipoles is a lot faster than a rotator, but coverage is less continuous . Spring Fever, Hay Fever, and on the positive side, Antenna Fever. The antennas are still in somewhat dis-array. But chugging right along in its 9th year of service is the trusty 80m folded dipole. The dipole serving the KazShack is cut according to the cookbook dimensions for folded dipoles outlined in the ARRL Antenna Book. In the ?? edition, the most recent available here, it is the lead off in Chapter 15, Portable Antennas. For those without the Antenna Bible, it was also re-published WITH permission from the ARRL, in the March 2002 edition of the CARC “FEEDLINE” newsletter. See pages 5 and 6. I didn’t realize it had been in service so long. Given its construction from 300 ohm TV twinlead, I expected the wires to fail. It has required a repair, but that was due to damage from falling limbs. That is a problem with all of the antennas here. It has occupied two seperate locations. Its first install favored the northwest, and it was really a killer into the upper Midwest, even with just 100w. It currently is oriented favoring a compass heading just to the east of due north. This improved the signals from Europe and the New England states, but is really a compromise. The wonderful thing about folded dipoles is the hugh SWR bandwidth. The local version favors the CW/80m end, but the 2:1 SWR bandwidth is from about 3580kc to 3800kc. It is still well below 3:1 SWR at the bottom of 80m. It goes above 3:1 at around 3970kc. The internal tuners of both the FT-920 and K2 can bring the match down to 1:1. Sweet. This antenna is a keeper. The only problem I have with it is that the construction article does not delve deep enough into the theory. I would like to reproduce the antenna using 450 ladder line, but don’t understand the methodology of the matching section well enough to scale the antenna. Hmmm. A conundrum. 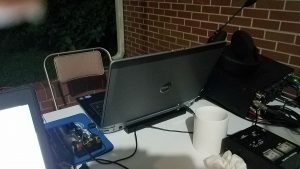 The 160m-L has been “on the fritz” (i.e., broken) since the ARRL 160m contest. It went crazy when it started raining during the contest. The SWR went high, and it became deaf. The ground was still covered with snow from our very rare in central NC five inch snowfall. 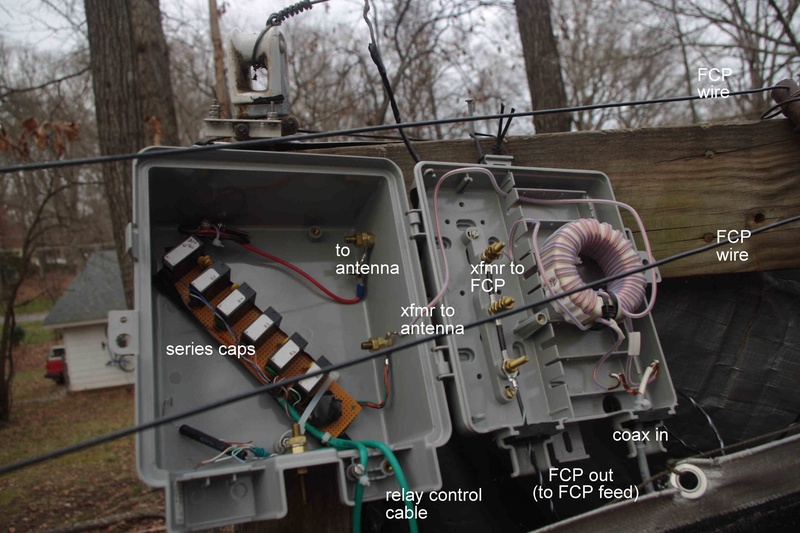 Old XYL tales relate that antennas work best when installed/repaired in inclement weather, so the time seemed right. It turns out there was a bad connection on one of the jumpers. I took a bit of time to find the problem, and only about 30 seconds to fix. To debug it I plugged the dummy load into the feedline system out at the antenna end. The high SWR into the dummy load told me the problem was in the line and not the antenna. Fixing the line solved the immediate issue. That whole antenna system needs closer scrutiny. It was intended to be ‘temporary’ when it was hauled up three years back, and the feed line is a hodgepodge of jumpers which were available around the KazShack at the time. If it stays up, the matching network needs to be corrected. At last count, it now has 18 elevated radials. 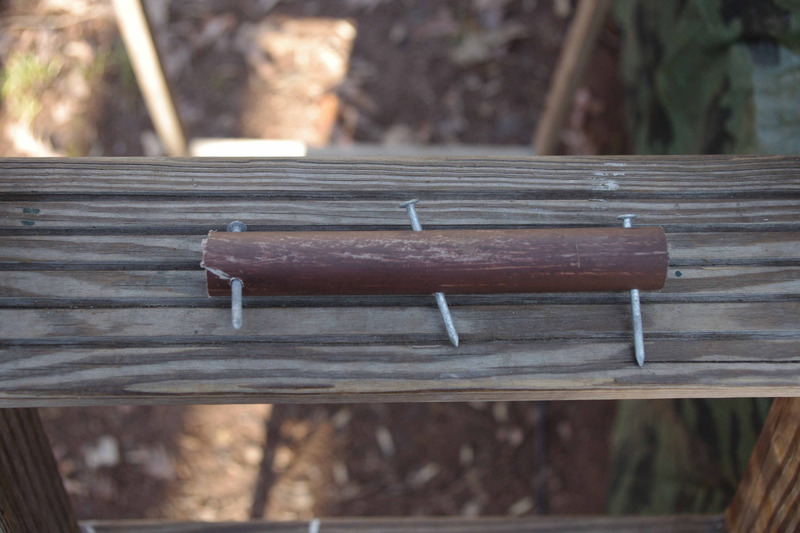 The feed point is about 8 feet off the ground mounted atop the kid’s wooden swing set. The radials are all of different lengths, tied off to trees. The distance of the tree from the antenna center determines the radial length. It seemed to be playing much better with 18 radials than it did in the original four radial configuration. I suppose I’ll play around in CQ 160 CW, but I expect it will be an all US contest here in the KazShack. 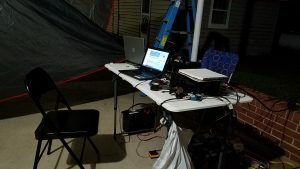 100 watts is effectively QRP when run into a poorly matched inv-L. I’ll find out if I feel like trying to run stations. The heavy winds from a couple of weeks back knocked loose a rather large branch, which clipped the nested rectangular loop for 15m and 10m. That simplifies the job of fixing it, something that has been much lower on the radio project list. But without sunspots, I’m still in no rush to get 10m fixed. 15m either, unfortuneatly.